Room additions are great solutions that provide additional living space in your home. They can be a great alternative to selling and buying a new home, and offer the opportunity for you to be creative and customize your living space. For example, you can elect to add a family room or bedroom, expand your kitchen, or even build a garage addition with overhead living space. Adding a room give you the freedom to aesthetically determine how the new space will tie into your existing home. You get to choose all of the exterior and interior finished materials. Room additions are almost like creating an entirely new home, especially if the project includes expanding a kitchen and/or adding a bathroom. Image Home Improvement, Inc. can assist you with all phases of your home addition. We start with a set of buildable room addition plans and submit building permits. You are, in essence, building a “mini house” when you make room additions. 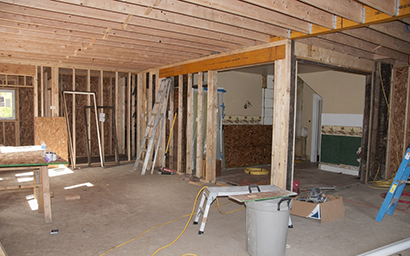 Many phases of construction that will be necessary are similar to those needed when building a new home. There is no doubt that a room addition to your house will be disruptive to the occupants of the home. Careful planning will keep this down to a minimum. Make sure you exhaust all other options before moving forward with your addition plans. Consult a realtor or appraiser to make sure you are not overbuilding for your neighborhood if you care about resale value when it comes time to sell. Sunrooms are an attractive alternative to a full-scale addition project. They cost less than a fully functional room, and they appear to give you just as much square footage. However, sunrooms usually do not have plumbing, showers, bathtubs, toilets, and other essential features. In fact, many sunrooms don’t even have basics such as insulation and may utilize screening in lieu of actual windows. Image Home Improvement has been building additions and remodeling homes in the valley for over 22 years. It is our mission to help you create your dream home to enjoy with your family and friends for many years to come!